latest children’s tune, was produced by Grammy award winner Jim Cravero. "Kobee Manatee: Shipwreck Sea Friends" is a fun underwater adventure written by Robert Scott Thayer and illustrated by Lauren Gallegos. Kobee, a bold manatee, along with his friends Tess, a brave seahorse, and Pablo, a fun loving hermit crab, head to Puerto Rico to explore the shipwreck of the SS Antonio López. Along the way, they meet several new friends of all shapes and sizes, ranging from an eight-inch long spotfin butterfly fish to a 40-foot long whale shark! This is the third book in the Kobee Manatee series and is published in collaboration with Fabien Cousteau, grandson of the legendary ocean expert Jacques Cousteau. While you don’t necessarily need to read the other two books first, you’ll find yourself falling for Kobee and friends and wanting to hear more about their adventures. Whether you are an avid sea explorer or simply someone who wants to learn more about our oceans, "Kobee Manatee: Shipwreck Sea Friends" is a beautifully illustrated children’s book that is the perfect addition to any bookshelf! Kobee reminds readers that our oceans are precious resources and the habitat for many a wonderful creature, and that we should do everything we can to protect them. In addition, each page contains some of Kobee’s Fun Facts, which provide children with real life information about the animals and locations that they read about in the book. The story truly comes to life thanks to Lauren Gallegos’ wonderful illustrations as you find yourself diving into the story and enjoying every moment of Kobee and friends’ adventure. "Kobee Manatee: Shipwreck Sea Friends" is a children's book written by Robert Scott Thayer and illustrated by Lauren Gallegos. It follows the adventurous manatee Kobee as he heads off to San Juan, Puerto Rico with his friends, Tess and Pablo. Their destination is the wreck of SS Antonio López that sailed during the 1898 Spanish American War. Each page also contains the very informative Fabien Cousteau's fun facts. Using a seagrass road map, they traverse in and out of the colorful reefs and meet a number of interesting creatures. Among them are Pat, the parrot fish; Chester, the enormous whale shark; a fearsome sawfish; a bored octopus who later accompanies them on their journey; a school of spade fish, the squirmy moray eel, the awesome stingray, and the yellow tail damsel fish. Their adventure is an interesting glimpse of Puerto Rico's amazing underwater world, but it is not without its dangers. What strikes me immediately about "Kobee Manatee: Shipwreck Sea Friends" is its colorful illustrations that are as cool as the waters of the deep blue sea. Designed for children below 12 years old, it is very informative, even for adults. Author Robert Scott Thayer teams up with illustrator Lauren Gallegos and Fabien Cousteau to come up with a completely delightful book that informs as well as entertains. Starting with a note on history, it goes on to introduce its readers to the wonders of the underwater world, but this is not all. "Kobee Manatee: Shipwreck Friends" is also a story of friendship between completely different sea creatures and it is something that humans would do well to learn from and emulate as well. This is a book that will make both children and adults alike appreciate the awesome inhabitants of the mysterious seas a bit more. 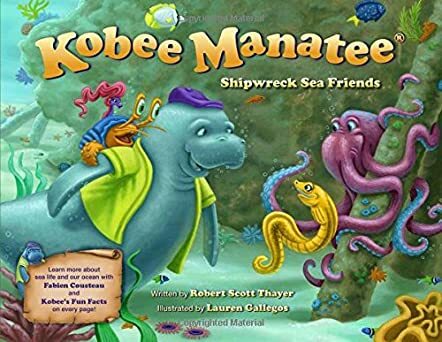 "Kobee Manatee: Shipwreck Sea Friends" by Robert Scott Thayer takes readers along with Kobee Manatee and his friends - Tess, the seahorse, and Pablo, the hermit crab - to find the wreck of the SS Antonio López. They meet a lot of interesting creatures on their way to the shipwreck that include an octopus, a whale shark, and a moray eel. Kobee gets trapped inside the shipwreck as they are exploring. Loaded with fun and an exciting nautical theme, the story will surely delight young readers with all the characters and the adventures they have. Will Pablo, Tess, and their new friends be able to pull Kobee out from the sunken ship? The book is filled with a lot of thrills and adventure that will draw children into it. It is also informative and educational and tells about the fish in the ocean, such as Caribbean reef fish, and many other interesting things, which is good for children to enhance their knowledge and learn new things. The illustrations are charming and adorable and they give a good pace and movement to the story. The story not only gives a peek into the life that exists under the water, but also captures the friendship of these aquatic animals nicely. There is a lot in the book for children to learn and understand about aquatic animals. It is a good storybook for read aloud sessions and parents can use it for bedtime storytelling too. Kobee and his aquatic friends will stay in the hearts of young readers for a long time. The narration is simple and neat and Kobee’s fun facts on each page are good for children to learn more about the life of creatures living under the sea. "Kobee Manatee: Shipwreck Sea Friends" by Robert Scott Thayer is a book that parents of little children will instinctively pick up from any assorted spread of children’s books at a bookstore, because of the superbly painted cover, which is designed to excite a child at first glance. The illustrator, Lauren Gallegos, has done a superb job, beginning with the book cover right through every page to the end. The visualization of the sea creatures is heart-warming, ranging from the chief protagonist Kobee Manatee to his friends, Tess the seahorse, and Pablo the hermit crab. Along with other sea friends with their smiles and friendship emanating in waves. Kobee is swimming through the sea with his friends to visit the old sunken wreck, the SS Antonio López, off Puerto Rico. And as the pages turn, the reader is greeted with beautiful scenes of life underwater to delight anyone. Author Robert Scott Thayer has strategically placed little sections on each illustrated page, where a brief description is given of the many sea creatures, the shipwreck, and other facets of life in the amazing underwater world of our planet. Young readers will have no difficulty in recognizing any of the many sea friends appearing in succession as one turns the pages, since the illustrations are so perfectly done. The current of empathy running through the book seeps into the soul of the reader and is designed to evoke feelings of courage, empathy and loyalty in children who read the book. This beautiful book is an inspiring eye opener for children, exponentially increasing their knowledge about the beauty of our planet, including that of the adults who read it. This is a five star effort and one looks forward to many more by this talented author. In "Kobee Manatee: Shipwreck Sea Friends" by Robert Scott Thayer, join Kobee and his friends on this amazing under-the-sea adventure in the beautiful oceanic world. Come along and experience the excitement and fun in this underwater journey. There is so much to learn and enjoy along the way, with exciting new discoveries and so much fun and beauty. Will Kobee and his friends make it to the SS Antonio López shipwreck? How will they survive the inevitable dangers along the way? "Kobee Manatee: Shipwreck Sea Friends" will make a good addition to your child's library. The adventure will draw kids into the magical ocean world and keep them captivated until the very end. There is so much fun and excitement to be had along the way on this adventure into Kobee's magical world in the ocean. There are also lots of new things to discover about this world and everything is explained in the fun facts section on each page. Kids will learn so much about what is to be found in the ocean, like the different types of fish and how they live. It is a new and exciting way for them to learn about life in the sea. They will enjoy this ocean adventure and will want to read it over and over again. The adventure comes alive on every page with colorful illustrations that pop off the pages to complement the narration. We have a 1 1/2 year old who loves to look through all of these books!! They are absolutely fantastic and can't wait for more to be released!